Top: Alex Parker, Ian Rae, Bert Slater, Alex Wright, Andy Irvine, John Prentice. 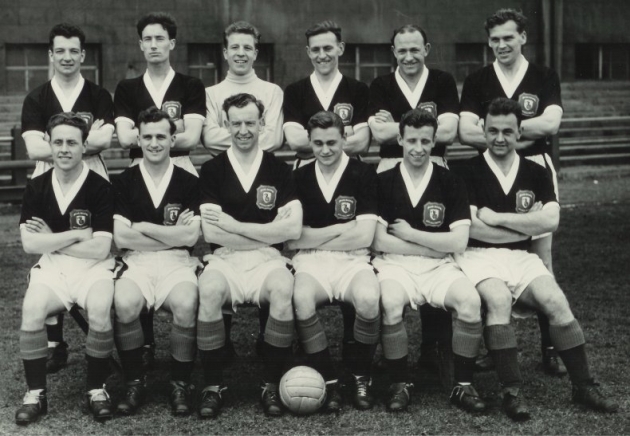 Bottom: Tommy Murray, Derek Grierson, George Merchant, Doug Moran, Eddie O'Hara, Jimmy McIntosh. Top: Reggie Smith (Manager), Ian Rae, Alex Wright, Bert Slater, Alex Parker, Andy Irvine, John Prentice, Ernie Godrey (Trainer).